Now I want to get rid of all these assumptions and build a mixer that given a desired torque and the motor+quad configuration – it can figure out how much throttle to apply to each motor. This is proving more complicated than I thought and the fact that I don’t have any formal math background doesn’t help at all. – Work in physical units. I want to to send the mixer 2 quantities: a torque in Nm and a collective force in N.
– Any (valid) motor configuration. X and + frames, quad, hexa, octo, spider, Y6 etc. Including motors with random thrust vectors – like a tricopter. Non-downward thrust vectors opens the door to a nice simplification as we’ll see below. Position is in local space, relative to the center of mass of the UAV. Max_thrust is in N and is the thrust of the motor at max_rpm. Acceleration and deceleration are used to model motor+prop inertia. 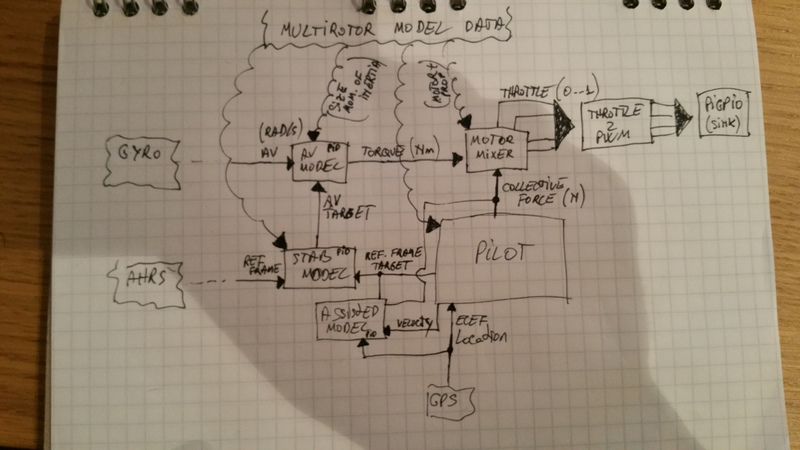 Now the problem is – how to figure out what throttle to send to each motor to get a certain torque and total force? Let’s consider a simple case: a perfectly balanced quadcopter with a + frame. Each motor points downwards so they generate a torque along one of the axis (and arms) but there is the yaw torque as well that needs to be taken into account. This can be modeled by simply tilting a bit the thrust vector which in turn creates a small torque on the Z axis. The tilt factor depends on the motor and prop but it’s usually a factor of the RPM or RPM^2. For now let’s consider it constant. So each motor produces a max torque: A, B, C, D.
2. I also want a total thrust of Th. 3. I want a, b, c, d to have the minimum values that result in the desired torque. So I want the optimal solution. For a quad, equations 1 and 2 are enough to calculate the optimal factors but for a hexa, octo or any other setup it’s not enough. I don’t know how to express eq 3 mathematically but this equation should result in an unique set of factors. So in the past days I tried to figure out how to calculate the coefficients for some very weird (but valid) motor configurations and in the end I gave up on the math approach. So what’s left when the analytic approach is out of reach? You try brute force of course. I wrote a small iterative algorithm that tries to find out the factors with a form of binary search. It’s very short and seems to be fast enough. It takes a motor config, a target torque and a step size and computes the factors with a precision of 0.0001. A step size of 0.01 requires ~3-7000 iterations, 0.1 requires 3-700 and 0.5 can solve it in 50-100 iterations. Pretty good. However I cannot prove that the algorithm will always converge (if I could prove this, then I could also solve the initial problem to begin with) and I’ve been running the algorithm all day yesterday with random valid motor configs and random target torques and so far I had no bad cases. //how far are we for the target? Now I have to test in in the simulator.